Build your Fit Body! Fit Body with Anna Victoria now has three new workout programs so you can follow custom workouts according to your fitness goal! Shred! At home workouts designed to help you shed fat and lean down. No workout equipment needed! Tone! At home or gym dumbbell based workouts designed to help you tone up and gain strength. Sculpt! Gym workouts designed to help you sculpt your fit body! -	Workouts only 30-60 minutes a day! -	Join the worldwide FBG community! Anna Victoria has been helping thousands of women around the world since 2015 achieve their fitness goals and improve each their mental, emotional and physical health. Join Fit Body with Anna Victoria and see how fueling, nourishing and challenging your body will give you the confidence and strength you have always deserved! Fit Body with Anna Victoria now offers three workout programs for you to choose from. No matter your fitness goal, Anna Victoria has a workout program for you! 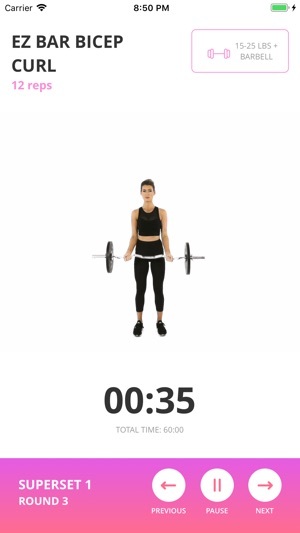 The Fit Body workouts are based on scientifically proven high-intensity and strength training moves designed to help you burn fat and strengthen your body at the same time! Fuel and Nourish Your Body! 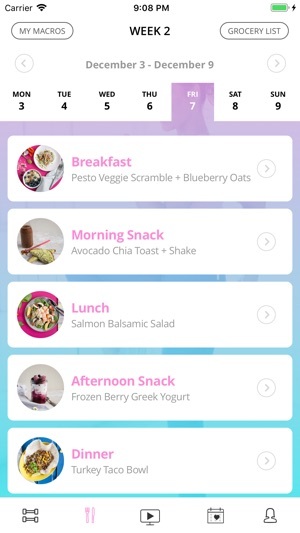 The first completely custom meal plan app – Fit Body with Anna Victoria customizes the entire meal plan around your personal caloric needs and macronutrient breakdown so know exactly what and how much to eat. They say abs are made in the kitchen, which is true! The Fit Body App Meal Plan will ensure you get the results you deserve from all your hard work in the gym. The Fit Body Guidance section offers guidance and instructional videos for various fitness topics, food topics, rehabilitative stretching and foam rolling, and most importantly, videos for ultimate Body Love! Body Love will help you learn how to balance your journey by focusing on your mental and emotional well-being, just as much as your physical well-being. Fit Body with Anna Victoria memberships starts with a 7-day free trial. After your 7-day trial, your membership will become active and you will be charged according to the membership plan and schedule you selected upon signing up. Membership will auto-renew and payments will be processed on a continual basis unless the subscription is canceled 24 hours prior to the end of the membership period. - All recipes in the 12 week meal plan are now unlocked! - Overall optimizations for speed and performance - yay! Thanks so much for your kind words, it means so much to us to hear how the app has changed your perception of diet and exercise, and helped you to learn how to nourish your body and mind! We love non-scale victories and are so proud to hear about yours! I have never written a review on here but this app calls for it. I’ve had this app since January 2018. I’ve never been addicted to an app as much as this one. This app offers you so much, it calculates your macros for you based off of required information like age and activity level and offers you meals based off your preferences (vegan, vegetarian etc). I’ve never been bored with the app. And now with the new update there’s a lot more options like sculpt, shred and tone. Sculpt for weight lifting and using the machines at the gym. Shred for specific weight loss. Tone for a combination which was in the app before the update. The format of the app is well done. The thing that blew my mind is the customer service!! The entire crew is responsive and they truly do their absolute best to help you. It doesn’t even feel like you are speaking with a customer service department. You’re speaking to a friend. 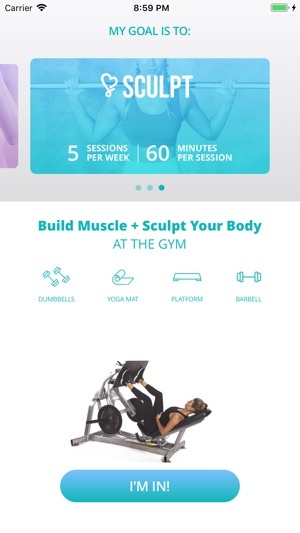 I’ve stopped going to the gym completely and started using the app for my workouts. Especially in the cold winter months, no need to warm your car and clean the snow off. Just need dumbbells and a mat. I’m seeing changes in my body that I’ve never seen before. And if you have Instagram, you pretty much get an entire crew to cheer you on. Honestly, from the bottom of my heart this is one of the best things that I’ve ever paid for. So incredibly happy and grateful for this app! Hi dkaur123! Thank you so so much for this incredible review! We really appreciate your feedback and are so happy to hear that you're loving the new workout programs and the ease of the meal plan! We're so grateful for users like you! 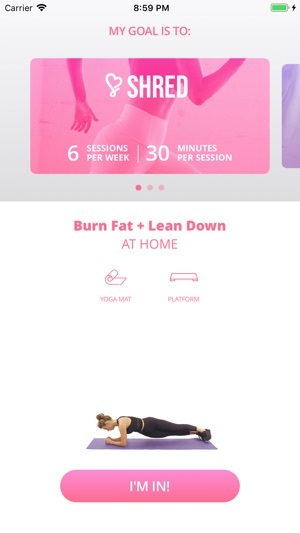 I can’t rave enough about this app - it’s truly the best workout app for several reasons. Very user friendly with 3 specific workout types (sculpt, shred, and tone) and 3 different levels (beg., interm., adv.) that you can choose from, so whatever is right for your fitness goals and needs. I LOVE that I can do every workout from the comfort of my home (I’m on week 11 of Tone with the intermediate option). The cardio components done 3x/week (grouped with the core circuits) specify what the intensity of your workout should be (low, high, etc) and how to achieve this, though you have the flexibility to do whatever kind of cardio you want! About 2 months into the program I started seeing changes in my body, I feel stronger, I’ve lost weight, and all my clothes is considerably looser! There’s also “guidance videos” that explain and address a multitude of workout/health/fitness related topics - very helpful. 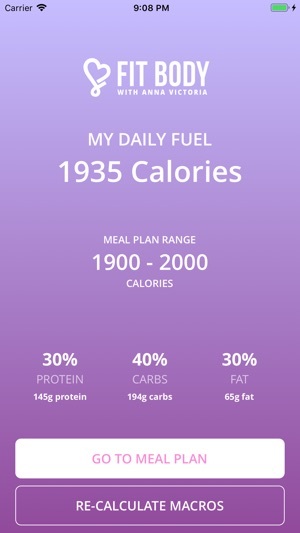 And on top of all that - the app customizes your macros AND meal plans based off your age, weight, goals, etc. Also includes vegetarian and vegan options. And anytime I’ve had a technical issue, customer service has been great. Anna Victoria has changed the game with this app and I could not be more grateful - worth every penny!!! Hi nina chipotle! Thank you so much for your review! We really appreciate the feedback so much! That's so amazing that you're already seeing progress on your fitness journey and that you're feeling stronger overall! We're so happy to hear how much you're loving the app!